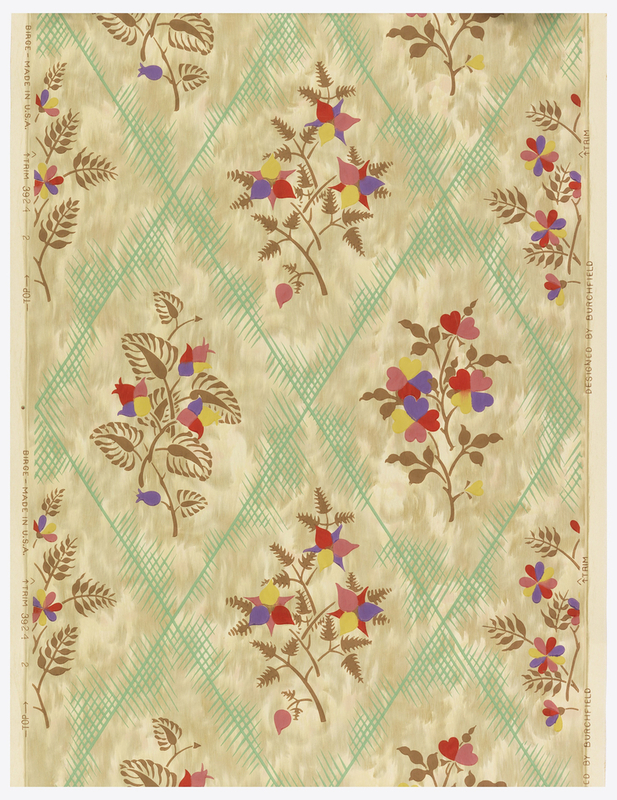 Many of the wallcoverings in the Cooper Hewitt’s collection were created by designers better known for their work in the fine arts. This sidewall, c. 1927, was designed by Charles Burchfield, a much-loved American watercolorist. A mint-green trellis embellished with cross-hatching divides the panel into regular diamond-shaped cells. Each cell contains a stencil-like image of a brown branch with multi-colored blooms featuring pink, red, yellow and purple petals. Though the color-scheme of the branches remains constant throughout the paper, four different “species” are depicted. The trellis and flora are done in opaque, monochrome colors, a marked contrast against the coffee-colored background, which resembles a mottled surface of watercolor brush strokes. This design was available in multiple colorways, one of which is shown below. Mr. Burchfield designed this paper in his last year of employment at M.H. Birge & Sons Co., a huge wallpaper manufactury based in Buffalo, NY (the oldest extant American wallpaper company when they sold to a Canadian concern in the 1950s). He began his tenure at Birge & Sons in 1921 as an assistant designer, and worked his way up to being the head of the department. Pressure to support his growing family convinced Burchfield to leave his hard-won position at Birge & Sons, and make the leap to full-time painting. This might seem a rather unorthodox choice for a man hoping to increase his salary, but luckily Burchfield made a wise business connection with Frank K.M. Rein Galleries in New York City. In April of 1930, Burchfield had his first show at the Museum of Modern Art. Though the world of wallpaper had lost a talented designer, the surreal and original landscape watercolors he became known for are certainly fair compensation.